Please see below for answers to general inquiries for becoming a Living a Creative Life signatory. If you have a question that isn’t listed here, contact Kaley Beisiegel at kaley.beisiegel@calgaryartsdevelopment.com. What does becoming a signatory to Living a Creative Life mean? 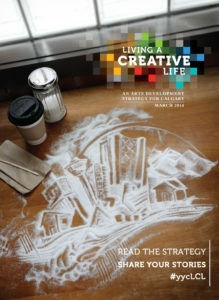 My organization’s work contributes to one or more of the outcomes in the Living a Creative Life: An Arts Development Strategy for Calgary. My organization believes in the overall vision and focus areas of Living a Creative Life, and therefore can also be counted as an endorser of the strategy. My organization will take Living a Creative Life into consideration when drafting its future strategic plans. My organization will share select data with Calgary Arts Development in an effort to demonstrate impact on the outcomes and focus areas that align with my organization’s work. My organization will designate a staff member as the primary contact and manager of our involvement with Living a Creative Life. Calgary Arts Development may contact the designated contact regarding this data collection. Calgary Arts Development may contact the designated contact regarding Living a Creative Life news and updates. My organization’s name will appear on lists of Living a Creative Life signatories and endorsers that will be made available to the public. After signing on, can an organization choose to no longer be a signatory? If an organization decides that it no longer want to be a signatory to Living a Creative Life, it can contact kaley.beisiegel@calgaryartsdevelopment.com to be removed from the signatory list. Does being a signatory have any impact on access to Calgary Arts Development’s funding activities? Being a signatory to Living a Creative Life is not an eligibility requirement for Calgary Arts Development’s community investment programs, nor does it inform funding decisions. Where can I see a full list of current signatories? A full list of current signatories is available here.